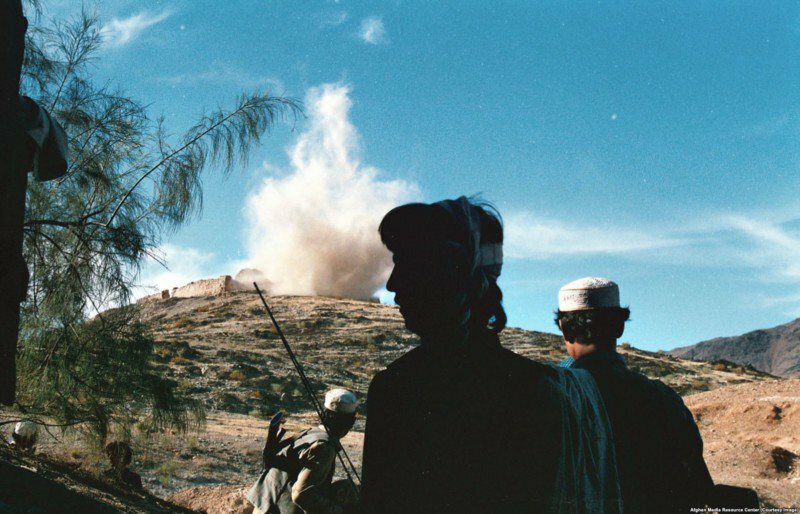 U.S.-trained Afghans photographed the Soviet invasion in the 1980s. These rare color photos bring the U.S.S.R.’s “hidden war” to light. 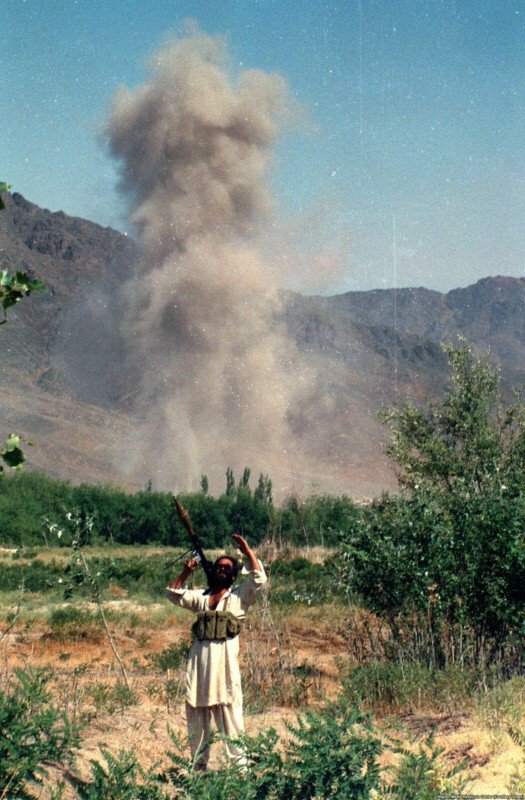 A fighter watches a Soviet bombardment hammer an Afghan valley. 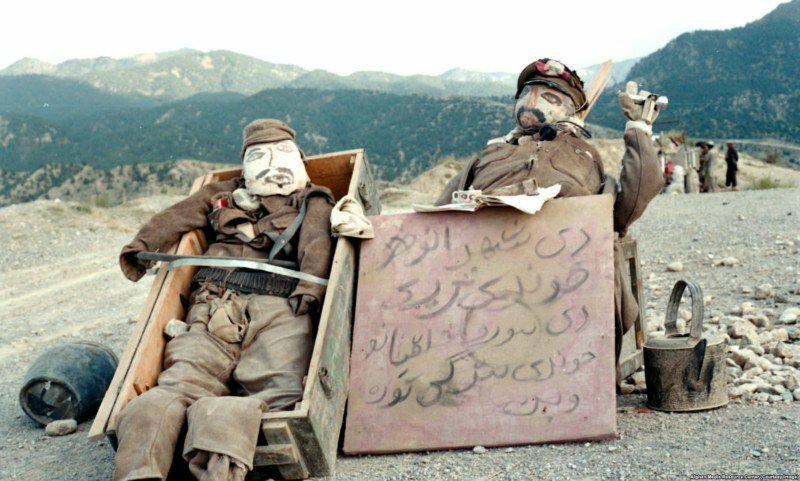 A bloody communist coup in Afghanistan in 1978 was followed a year later by a full-scale invasion by the U.S.S.R.
A militant in training scrabbles through an obstacle course. 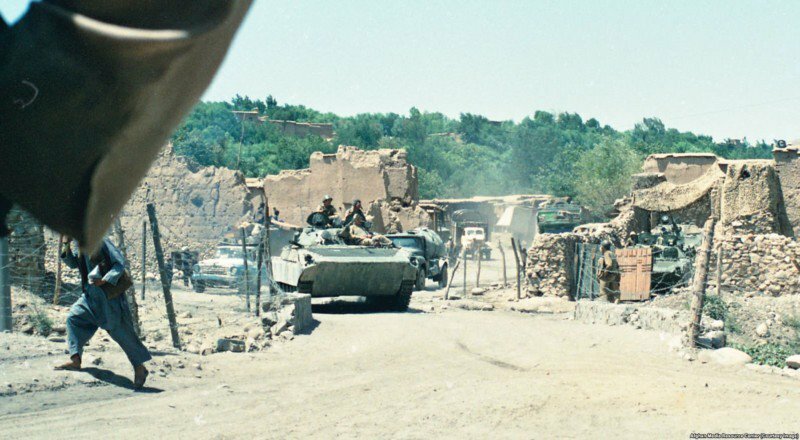 The 1979 Soviet invasion was widely condemned at the United Nations and helped fuel one of the most expensive CIA operations in history. 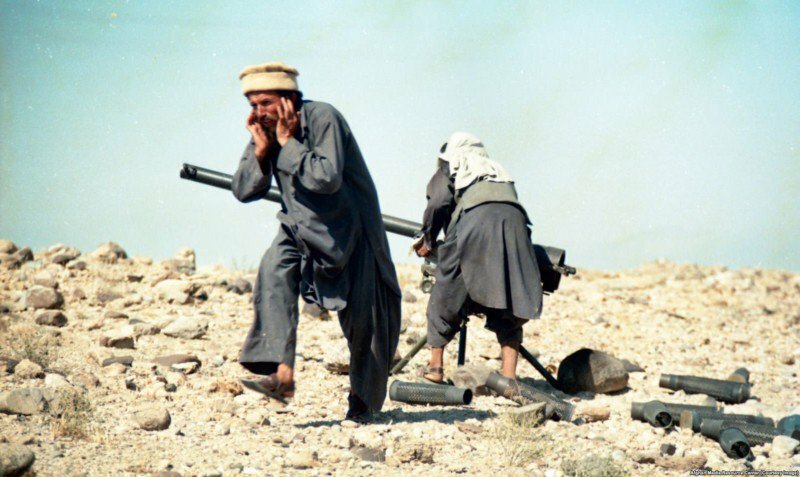 Members of the anti-Soviet “mujahedin,” as the jihadist fighters opposing the Soviets became known, with stacks of weaponry. 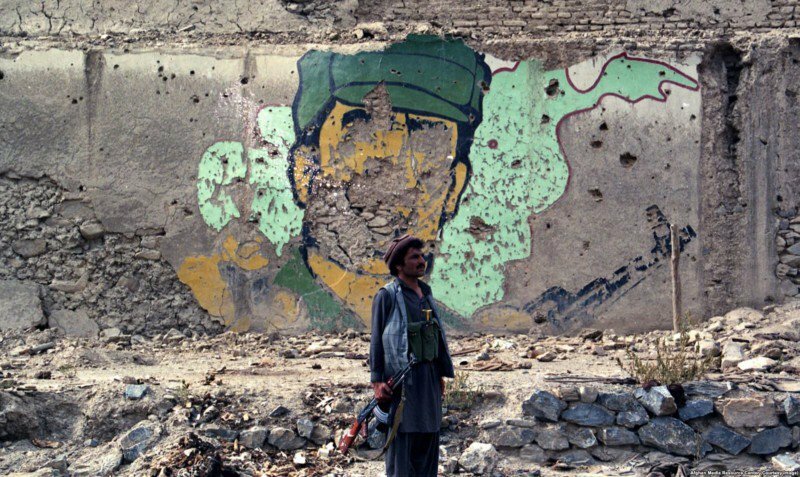 Reportedly beginning in 1979, the CIA began secretly funding the Muslim militant groups that would spend the next decade fighting against the Soviets. 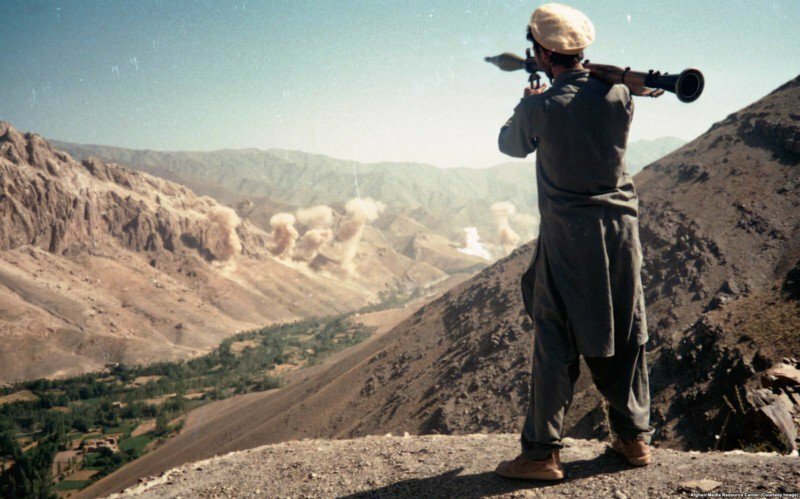 A mujahedin fighter scans the sky after an air strike. 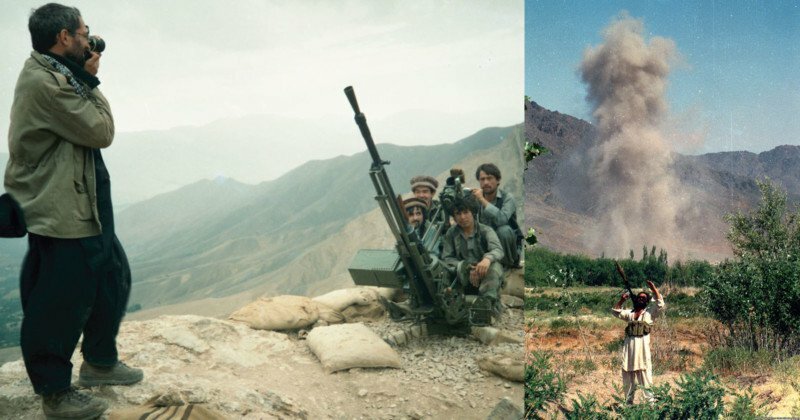 As conditions became increasingly risky for foreign journalists inside Afghanistan (in 1984 a Soviet diplomat vowed any journalist caught with mujahedin fighters would be killed), Washington also funded a controversial program to supply Afghan rebels with cameras. 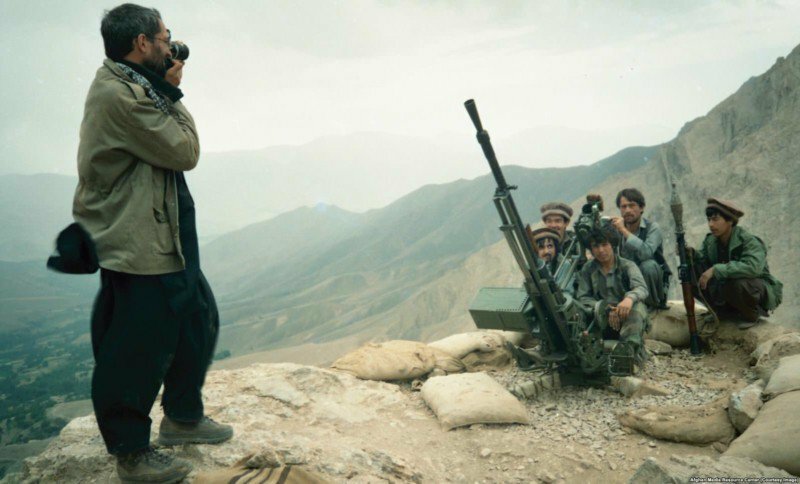 A photographer snaps a portrait of mujahedin. 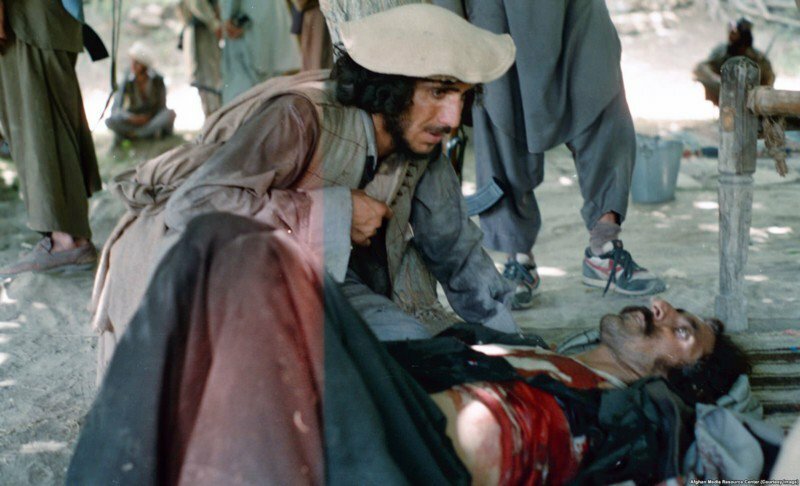 Beginning in 1985, American journalists began training Afghans in visual reporting. 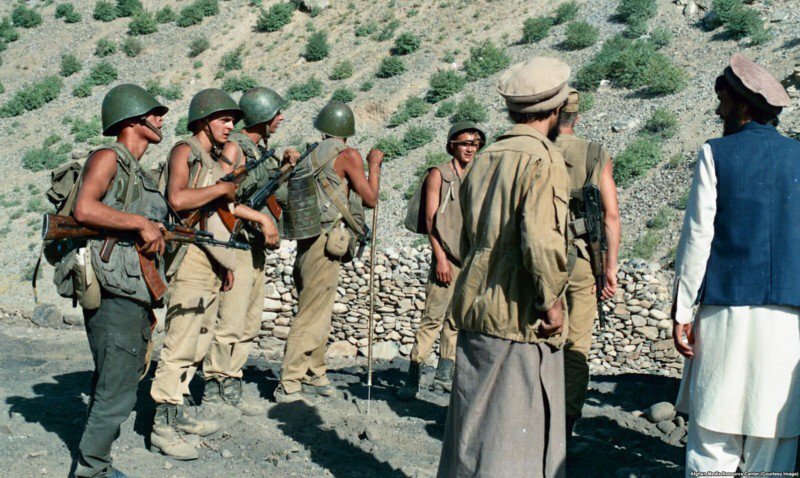 The Afghan Media Resource Center (AMRC) handed out some 50 cameras to teams embedded with mujahedin groups to document what had become a “hidden” war because of the obstacles to foreign reporting. The photographs in this gallery are some of the 94,000 images made during the project. A Soviet field base. More than 20 of the photographers and journalists working for the AMRC project were injured, and two were killed. 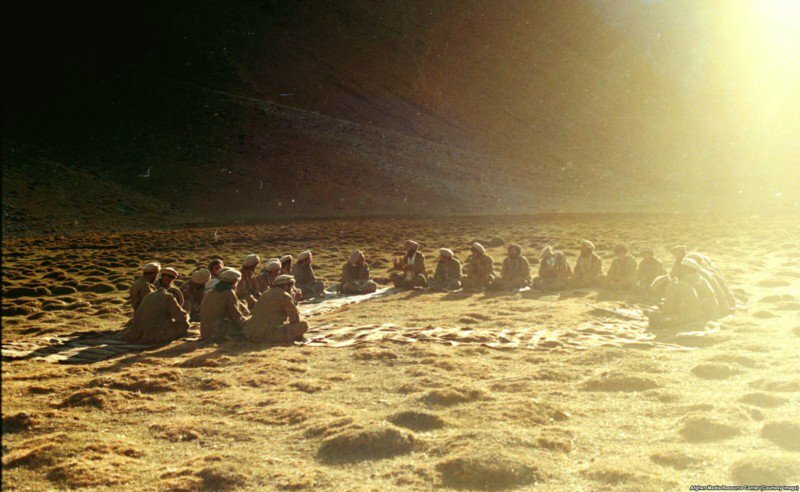 Mujahedin during a meeting in Parwan Province. 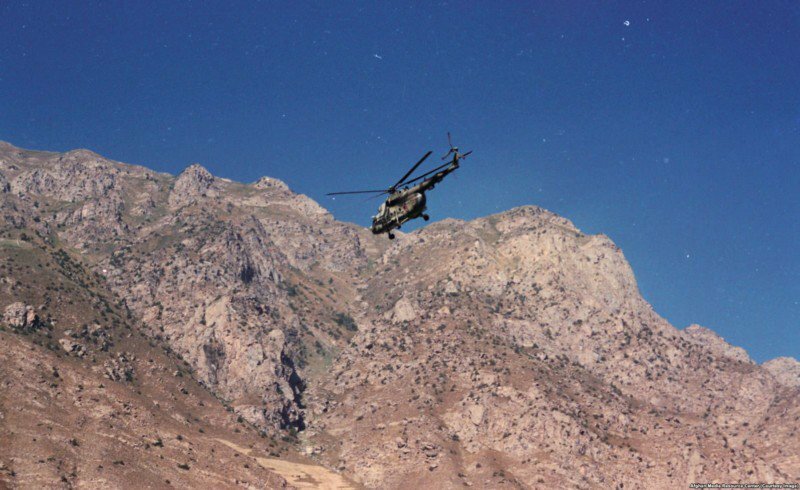 A Soviet helicopter thunders low over a village. 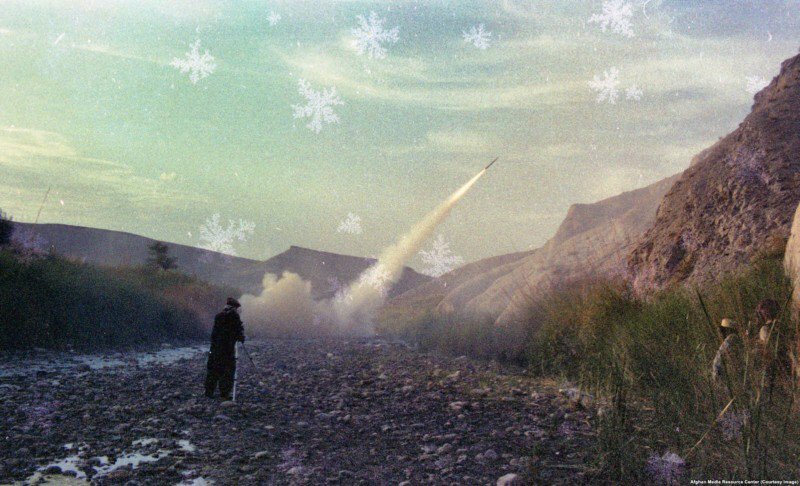 A Soviet-made missile being fired by the mujahedin. 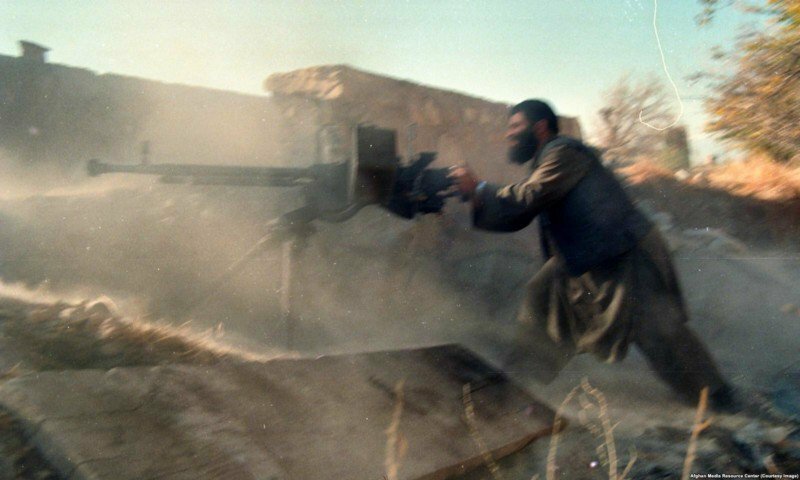 Most of the CIA-funded weapons supplied to the Islamic militants were made in the U.S.S.R.
Mujahedin fighters firing a recoilless rifle. 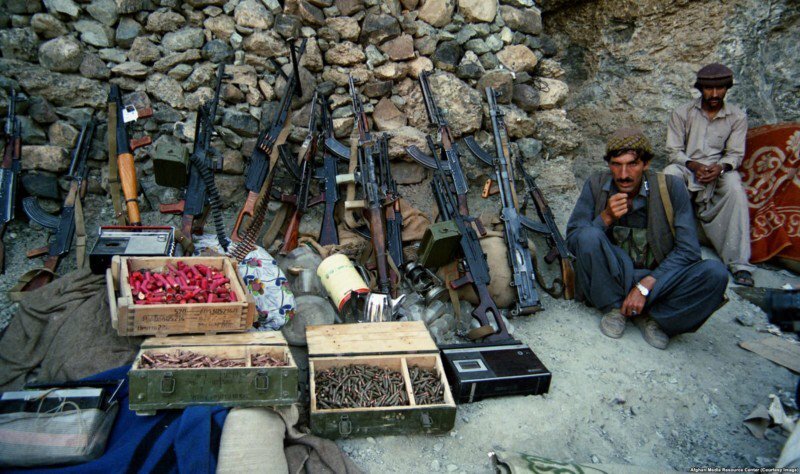 A U.S. official recalled that the CIA bought such weapons from various sources, including a corrupt unit of the Soviet Army in Afghanistan. 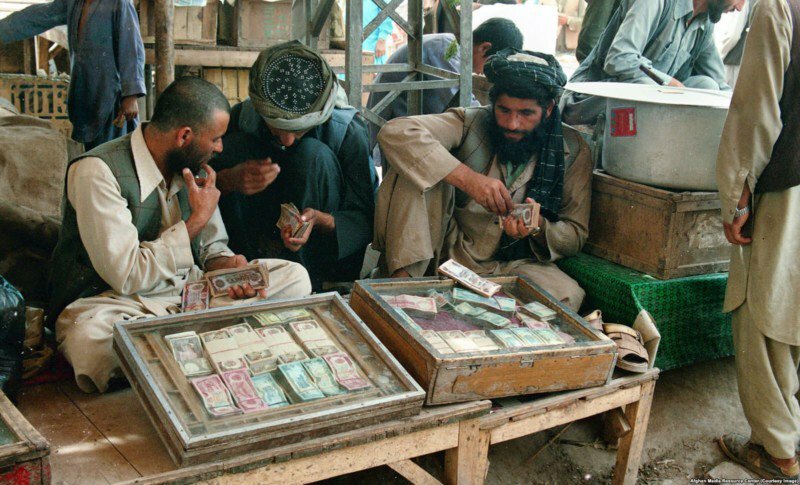 As well as their main task of chronicling the war, the teams of AMRC photographers shot everyday life, like these money changers in Peshawar. 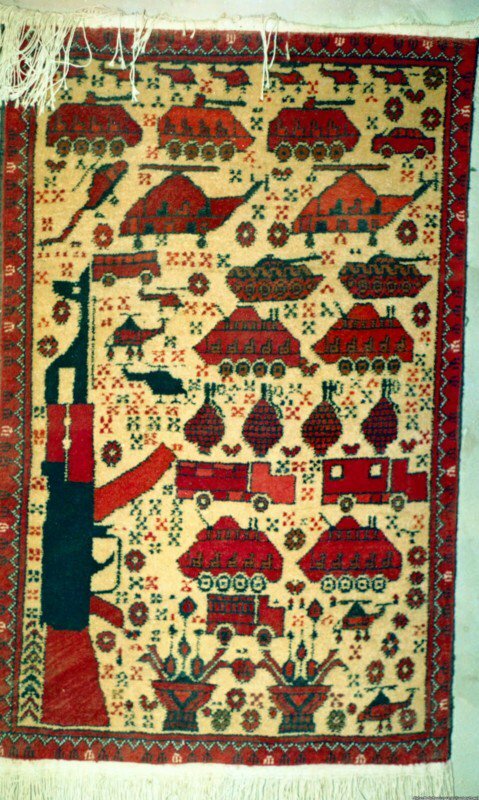 Soviet weaponry depicted on a carpet woven by Afghan refugees. 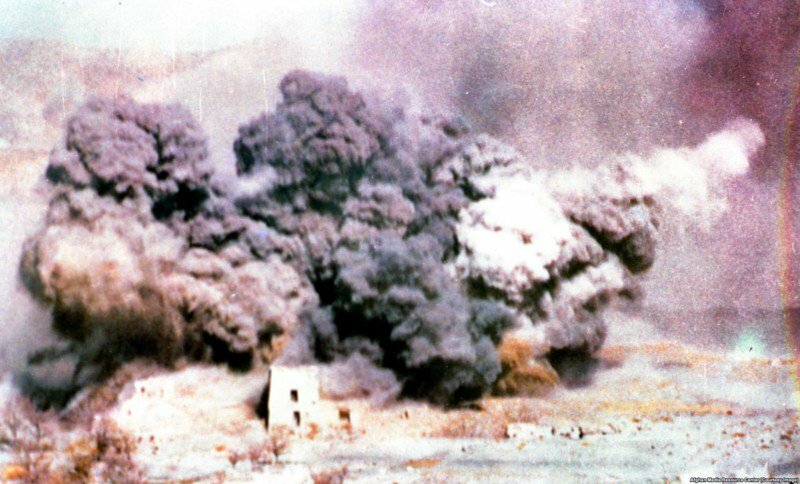 An air strike shatters an Afghan village. 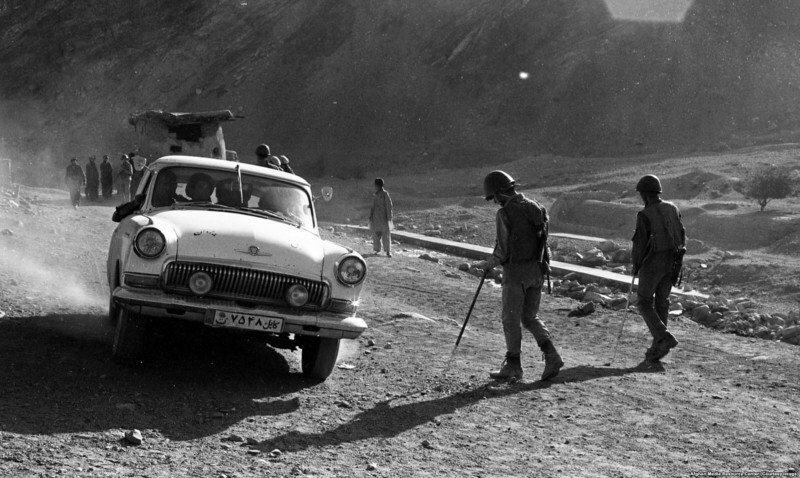 Much of the fighting was a brutal back-and-forth with mujahedin ambushes on Soviet convoys followed by Soviet aircraft wiping out villages near the sites of the attacks. 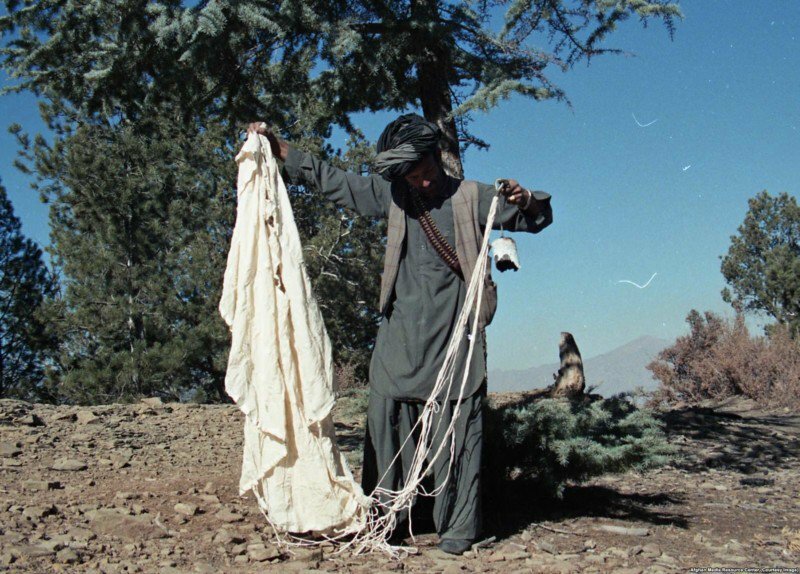 A mujahedin fighter holds the remains of a parachute bomb. The design allows ground-attack jets to drop bombs at low altitude without being caught up by the explosion. 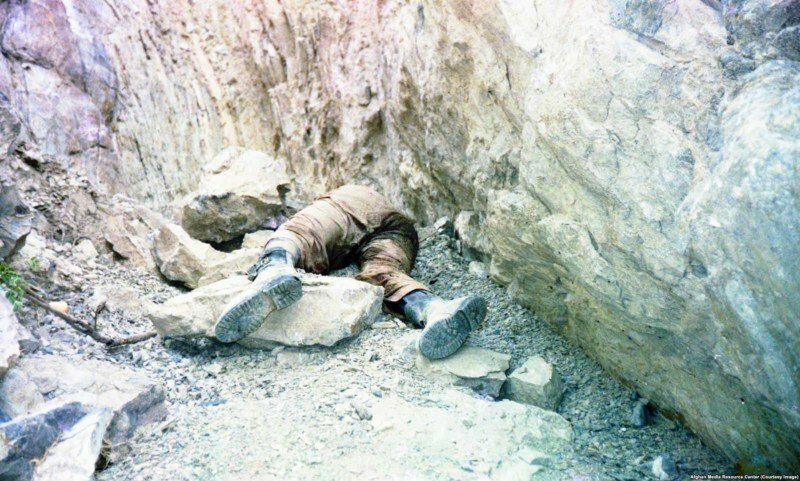 A guerrilla commander lies dying after being shot by a “Soviet spy” during a wedding party. The corpse of a Soviet soldier. More than 14,000 Soviet troops were killed during the nine-year war. 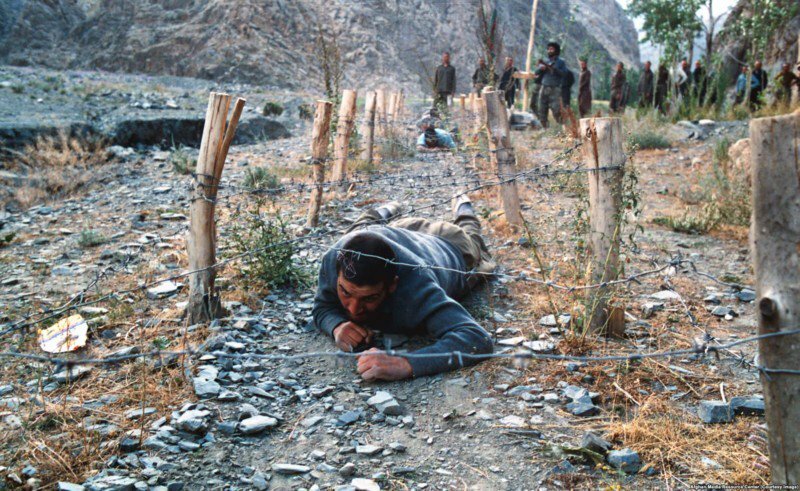 The body of an Afghan man killed in a Soviet bombardment. 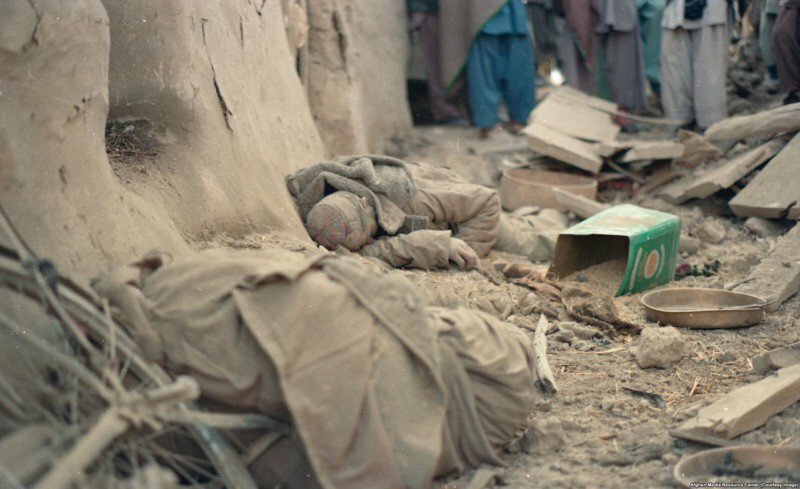 At least 500,000 Afghan civilians were killed and 5 million more — or one-third of the population — displaced. 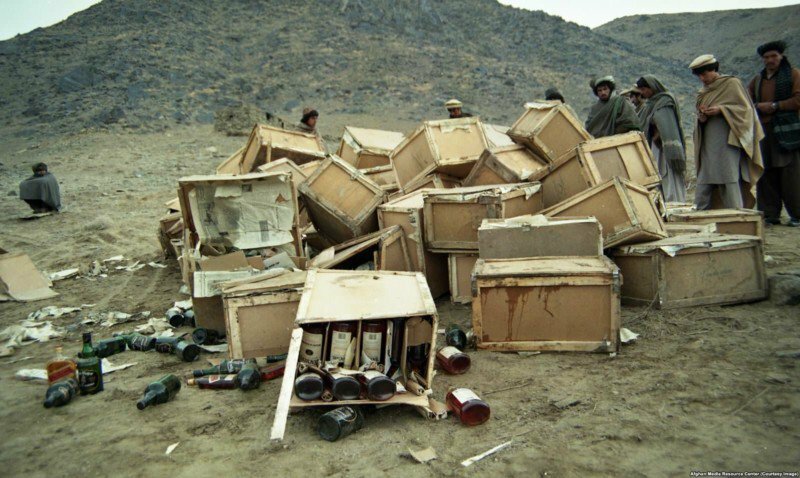 Alcohol seized by a mujahedin group, probably before being destroyed. A fighter at a heavy machine gun. 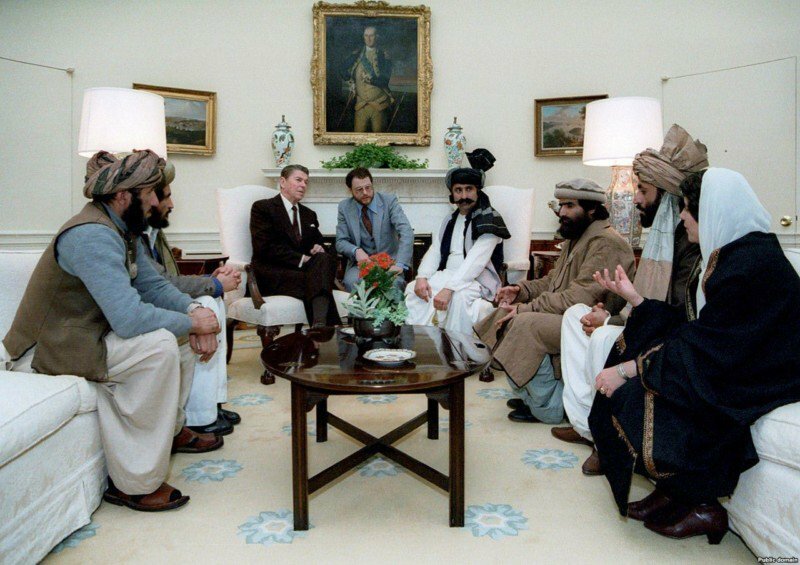 Some of the mujahedin groups financed by the CIA were radical Islamists that would later form groups designated as “terrorist organizations.” Although Osama bin Laden fought against the Soviets, it is disputed whether he ever received U.S. assistance. A “butterfly mine” lying in wait for a victim. 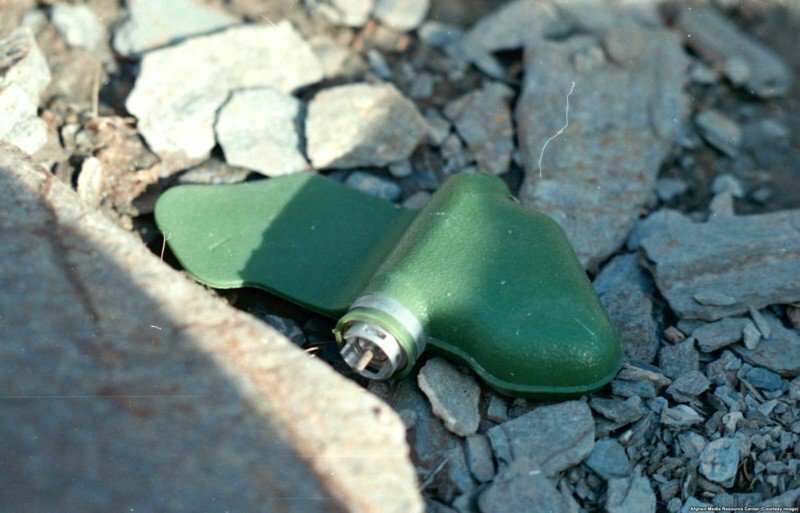 Millions of the cellphone-sized devices were dropped from Soviet aircraft across Afghanistan. The jungle-colored mines were easily spotted and avoided by fighters, but many injured curious children. 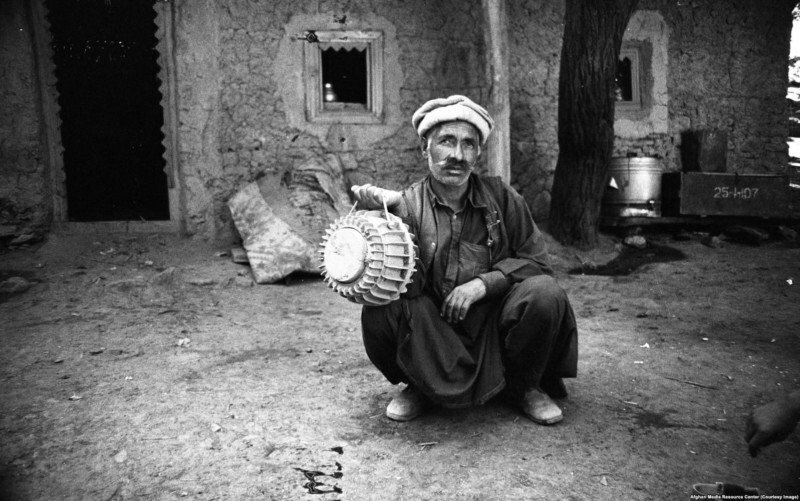 An Afghan man wielding an Italian-made antitank mine. 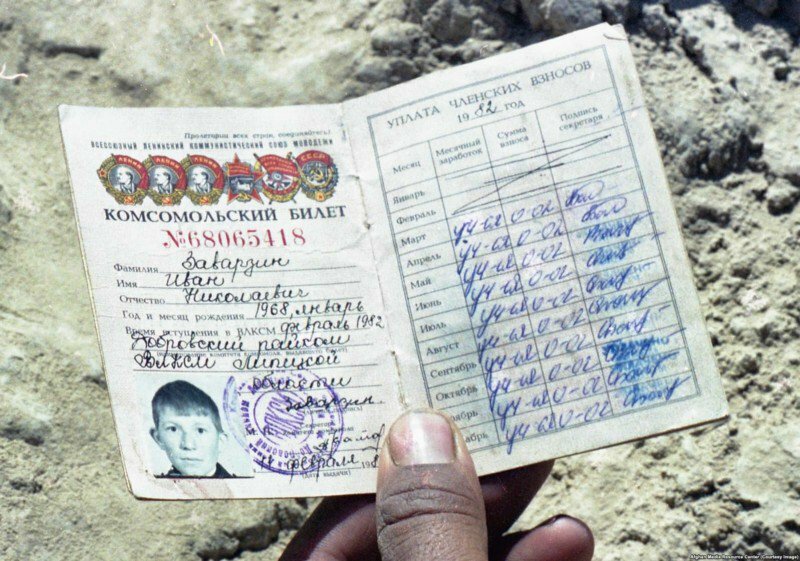 A captured identity card for a Soviet soldier named Ivan Zavarzin. 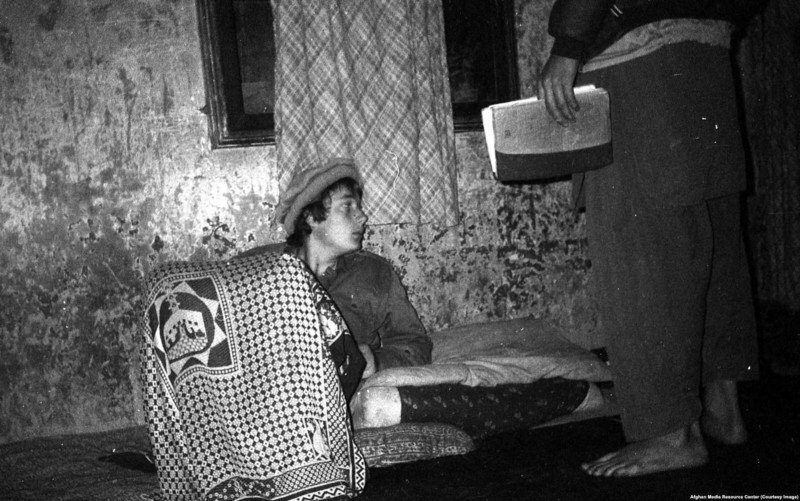 A soldier who had defected from the Soviet Army and converted to Islam. 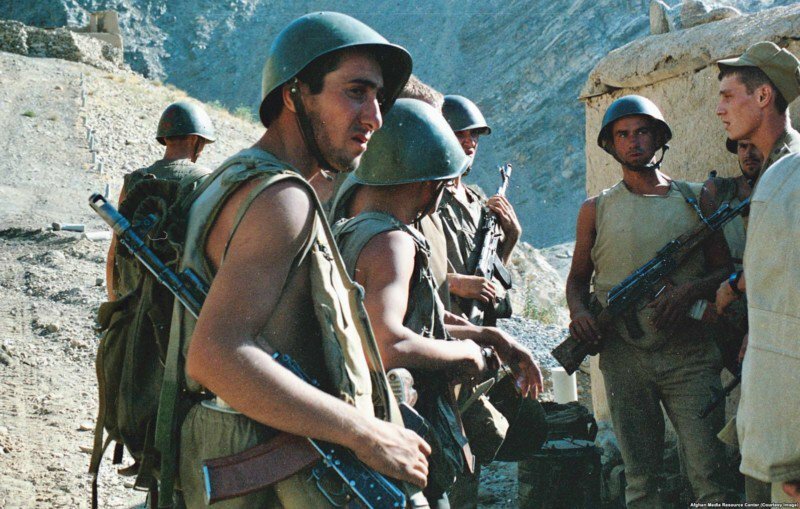 By the end of the war, some 200 Soviet troops who had deserted or been captured remained behind in Afghanistan, where several still live today. Soviet soldiers on patrol. Accusations of atrocities during the war further tarnished the Soviet Union’s image. After catching Afghan children torturing wounded comrades, one soldier admitted rounding up several women and children, pouring kerosene on them, and burning them alive. 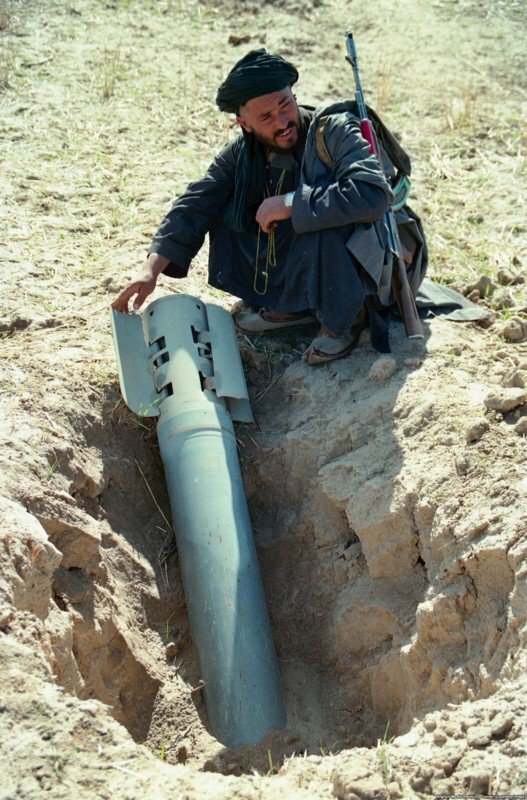 A mujahedin fighter with an unexploded Soviet rocket. When the AMRC archive was handed to the U.S. Library of Congress in 2016, a speaker noted the images filled “a huge gap” in the visual record of the Soviet Union’s last war.